Conditions were poor... poor 'seeing', poor 'transparency' and wispy tendrils of cloud covered the sky. But it was sunny! Nice Rick, the little sunspot group is persisting! I hope the sun is enjoying his little nap these past few years. Wake up, ya lazy lout ! That is awesome. I am just getting into solar astronomy so it would help to know what you captured this image with (camera, quark, scope). I am considering getting a Daystar SS60-ds with the integrated quark filter. Any comments on that? My scope is a Lunt LS50 with B600 diagonal/filter. 50mm objective lens of 350mm focal length, making it an f7 system. My camera is a ZWO ASI 178MM that has a maximum square frame resolution of 2080 x 2080 pixels of size 2.4 microns. For Ha imaging, the maximum pixel size that should be used for good image resolution = f# / 2.8. In my case, maximum pixel size = 7 / 2.8 = 2.5 microns. Thus, the ASI 178 with its 2.4 micron pixels is an excellent match to my system and I typically image with a region of interest of 1600x1600 pixels - that captures the full solar disc with space around it for the normal to larger size proms. RE: I am considering getting a Daystar SS60-ds with the integrated quark filter. Any comments on that? 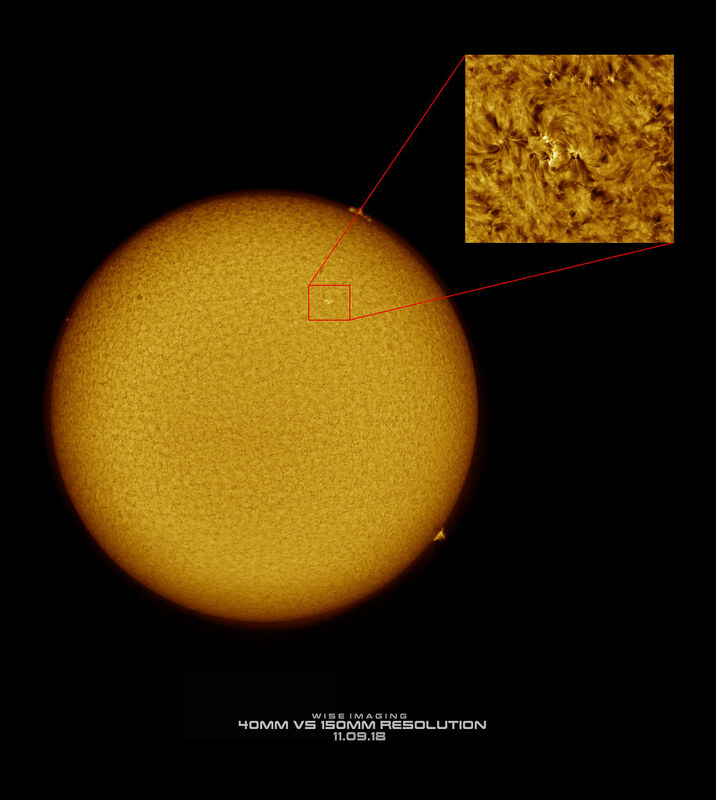 At that long 930mm focal length, you will never capture a full-solar disk in one image. To image the full solar disc, you would need to stitch together a mosaic of multiple images - something most folks don't like to do. Without doing a mosaic, that scope will restrict you to sunspots and prominences. At f/15.5, the camera you ideally want would have a maximum pixel size = 15.5 / 2.8 = 5.54 microns. The ZWO ASI 174MM with 5.56mm pixels would be an excellent match. Thank you for such a helpful response. What is the max f ratio that I could have to see the full disk? I kind of like the more closeups of just a part of the disk and the edge with proms so this f ratio may actually work well for me. RE: Follow up: What is the max f ratio that I could have to see the full disk? It more a question of the maximum focal length and the number & size of the camera pixels. My LS50, 50mm objective, 350mm focal length is f7. 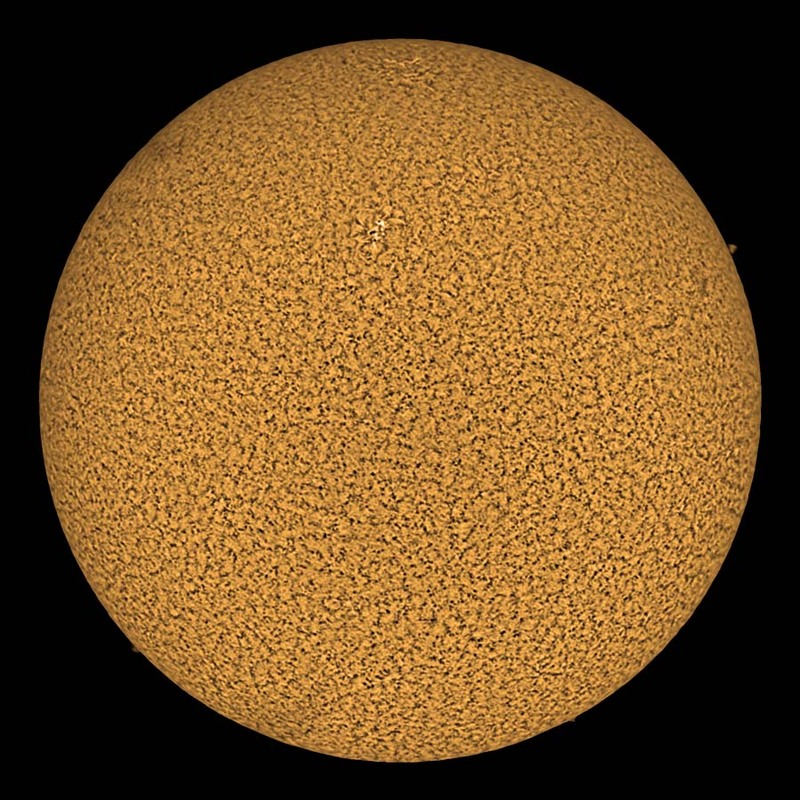 With the 350mm focal length, the diameter of the image of the sun with space around it for proms is 1600 pixels of size 2.4 microns with my ASI 178MM camera. i.e. 1600 x 2.4 microns = 3.84 mm. The maximum square frame of of the ASI 178MM is 2080 pixels of size 2.4 microns = 5.0 mm. Given the limitations of the camera (max image size of 5.0mm), we can calculate to see what the max focal length could be. Max focal length to use with the ASI 178MM would be, x / 350mm = 5.0 / 3.84, x = 350mm x (5.0 / 3.84) = 456 mm. Your 60mm objective, 930mm focal length is f15.5. The f15.5 is required before the built-in quark for the quark to operate properly. Some folks do add a focal reducer after their 'original quark' to lower the effective focal length and f#. Whether than would work here, I can't say - having no first hand experience. Note that focal length of 465mm is just over the limit of 456mm for the ASI 178MM... so maybe you could capture the full solar disc with somewhat less space around the disc for proms. The new f# of 7.75 is OK for the ASI 178MM camera; Ha max pixel size = 7.75 / 2.8 = 2.8; that is larger that the 2.4 micron pixels of the ASI 178MM so you are all good. I think you need others with direct hands-on experience using a Quark & Focal Reducer to chime in here. Thanks Rick. That makes alot of sense. I currently have an ASI 294Pro Color. It has a 4.63 um pixel so it right on for f15.5. I know it is color which is not ideal and it is a 12 MB camera so I wonder how that will look. I guess it can't hurt to give it a try. I also have a NextImage 10 with 1.67 um pixels. I think I will just experiment a bit and maybe look into getting the focal reducer. RE: I also have a NextImage 10 with 1.67 um pixels. I also have that camera but my 'basement tests' indicated that it was very insensitive to Ha. 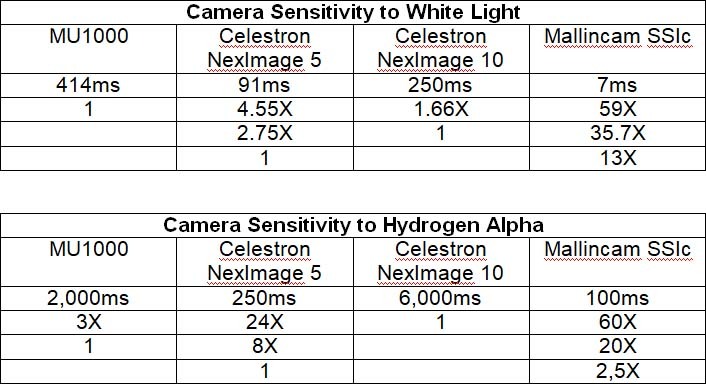 In white light, the NexImage 5 was 250 / 91 = 2.75X as sensitive as the NexImage 10. In Ha, the NexImage 5 was 6000 / 250 = 24X as sensitive as the NexImage 10. Interesting. Not sure why I bought that camera...you live an learn. I am considering getting a Daystar SS60-ds with the integrated quark filter. Any comments on that? If you're going to consider a Quark, get a stand alone Quark and use whatever scopes you want to. If you're willing to pay $700 for a fused Quark in a small achromat, I would suggest you simply get a Lunt 50mm instead. I have been doing a little math and I was hoping you could verify my numbers. Assuming an ASI 294 camera with 4.63 um pixels and a 23.2 mm diagonal. Since the Sun is only 30 arc-minutes across, it seems that both could do a full disk but my camera is matched much better to the Daystar. Plus, I think I could get better resolution on details/proms with the higher focal ratio of the Daystar. Thoughts? Have I made any errors. Also, they the claim the Quark Daystar is already effectively "double-stacked". This makes it much more cost effective for an equivalent Lunt if true. Be very wary of this kind of marketing. It's not double stacked at all. It's not effectively near double-stacked either. I would take a Lunt over Daystar's latest entry level Quark-fused-achromat, Scout series, etc. And I would take a normal Quark over any of Daystar's "quark-scopes" and I would take a normal Quark over a small Lunt, but my interest is high resolution. If your interest is more full disc, then front mounted etalons like the smaller Lunts are a better way to go. If your interest is more full disc, then front mounted etalons like the smaller Lunts are a better way to go. If you're interested in high resolution (close ups) and not the full disc, you do not want to limit yourself to 60mm aperture. You certainly do not want a Quark fused to a 60mm little scope in this situation. And you don't want a Lunt 50mm or 60mm or any 60mm either, if you're mostly interested in close up high res. A standard Quark can be used with large aperture instruments, up to 150mm refractors, and that is where you can get into high res close up shots of the surface and features. A standard Quark is good to go on apertures up to 150mm. So you can use a 60mm if you want, or an 80mm, 100mm, 127mm, etc to change scales and use your existing scopes. Or, if you're buying a scope, big aperture achromats are inexpensive and excellent for this. How to piggyback a guidescope?